Times are tough, and Magic Bronson is nervous. The Los Angeles-born-and-based duo has spent its six years together soaking up what’s going on in the world, and they’re profoundly uneasy. 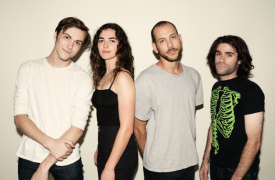 Their response to most situations is to write a song, which is how the 2017 track “Nervous” sprang into life – and if you’re new to Magic Bronson, “Nervous” is a good place to start. The itchy lyric – “All the things that make you nervous/ Crooked cops and guilty verdicts/ Fires, floods, parking permits” – is countered by an absolute swirling corker of a synthpop melody, and its earworm properties are pretty spectacular. Most Magic Bronson songs nail that same combination – stone-cold melody-making paired with lyrics that are provocative and sometimes trippy. 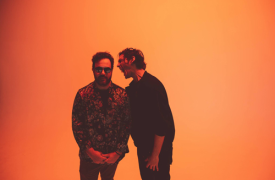 What makes it special is that the duo - Matt Lieberman (bass, synths, most lyrics) and Michael Nicastro (vocals, synths, drum programming, production) - is constitutionally unable to write the same song twice. There’s a wry, slacker-cool and slightly stoned thread running through everything, but beyond that they never know quite what will come out of the pot once they’ve thrown in and stirred the ingredients. The only constants are fat bass, sumptuous choruses and lyrics that range from artful absurdism to plain old pure emotion, as expressed by two guys who’ve had a long day and need to vent. 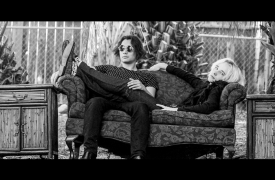 The Gooms are a Los Angeles based garage rock band whose edgy and melodic sound derives from a die-hard love of surf, punk, jazz, and all that lies in between. Their off-kilter brand of noise rock coupled with catchy hooks and dirty instrumentation make them a force to be reckoned with. They won’t apologize for stirring a ruckus in your ear canals, but they will give you a hug. The Coachella Valley is where YIP YOPS were born and still call home. However, there’s an indefinable and indescribable urge that spurned the duo - frontman Ison Van Winkle and drummer Ross Murakami - to send their own kind of aftershocks through alternative music. The band’s singular sound could’ve been signed to Factory Records in 1981, but feels at home on your favorite Spotify playlist. That’s why the pair achieved the seemingly insurmountable within a few years of crystallizing its lineup (and graduating high school). They went from gracing the stage at Coachella, Chinatown Summer Nights, and Echo Park Rising to building an organic buzz online. Counting New Order, The Smiths, and Pink Floyd among myriad influences, their sound tempers layered harmonies over swooning synths, robust accentuated guitars, and hyper-charged beats. Rising out from the area’s monolithic musical shadow, they prove the classic possibilities of musicians jamming in a suburban garage. 2018 sees the duo release more music as they push the single “She” and hit the road once again. 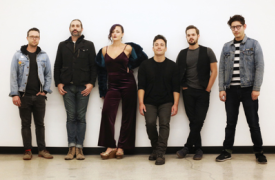 The Colour Coast came together in late 2016 in Los Angeles, and consists of members with roots in Canada, Argentina, El Salvador, Nicaragua and Minnesota. Their songs inject tropical and Latin dance rhythms into wide melodies, creating a sound that pays tribute to their range of cultural backgrounds and musical influences. The end result is a unique, danceable brand of indie rock peppered with the flavours of classic disco and Cumbia, which they're calling "tropical indie rock." They've hit the ground running in 2018; releasing their first EP in January, booking shows at SXSW for March, and playing a successful month-long residency at The Satellite. The momentum around this group is gaining quickly!